Home Animals What is the Difference Between a French Bulldog and a Boston Terrier? 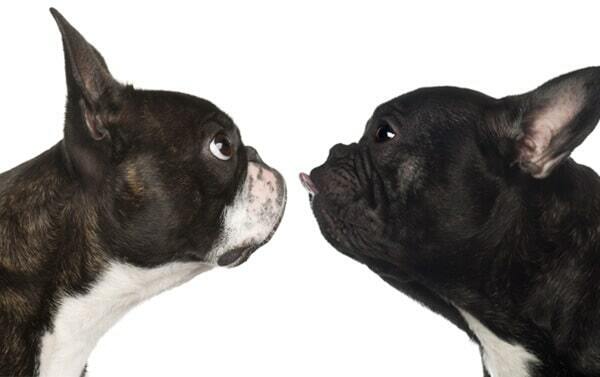 What is the Difference Between a French Bulldog and a Boston Terrier? If you don’t own either a French Bulldog or a Boston Terrier, it can be rather difficult to distinguish between the two breeds, mainly because of their similar physical appearance. This is quite normal, since the American Kennel Club (AKC) indicates that both of them share a common predecessor in the English Bulldog. Even if some people might confuse the two, or even think they’re the same breed, there’s no French Terrier out there. Today, we’re going to explain the difference between a French Bulldog and a Boston Terrier by looking at their ancestry, physical characteristics, and temperament. While it is known that the Boston Terrier originated in America as a result of the breeding of an English Bulldog with a white English Terrier, the ancestry of the French Bulldog is a little bit more misterious. AKC speculates that the dog originated from a cross between a toy-sized English Bulldog and various small dog breeds from France. Despite being cousins, there are several clear distinctions between the Boston Terrier and the French Bulldog, or Bostons and Frenchies, as their owners affectionately call them. The two breeds have both inherited the signature pug-like face of the English Bulldog. They have an unusually large and square-shaped head, and bat-like ears that stand straight up on their little bodies. However, the physical similarities between these adorable dog breeds stop right there. Of the two, French Bulldogs have shorter, heavier, and wider bodies. Frenchies also have a larger bone structure. This causes them to possess a stockier build on their extremely short legs. In contrast, Boston Terriers are slimmer, lighter, and taller. Plus, they have long legs that help them off the ground more easily. Bostons usually weigh between 15 and 25 pounds and have a small bone structure, whereas French Bulldogs weigh up to 28 pounds and have a compact form. In terms of coloring, Boston Terriers are normally black with white markings in between their eyes, across their muzzle, across the front part of their chest, and down their legs. Unlike Bostons, which never have only one color, French Bulldogs are usually completely white, fawn, or brindle. Breed standards for Frenchies indicate that the dogs may have some white markings when colored brindle, but black, gray, or tan colors are not allowed. While both breeds possess short and smooth fur that makes them sensitive to extreme heat or cold, Boston Terriers have tighter skin that is firm and close-fitting. French Bulldogs have looser and softer skin. This tends to create heavy wrinkles around their well-rounded faces and shoulders. Both French Bulldogs and Boston Terriers have an excellent reputation for being intelligent, well-behaved, friendly, sweet, loyal, and deeply affectionate companions for people of all ages. However, there’s one major difference between the temperament of the two breeds. They have dramatically opposing energy levels. Due to their slim build and agility, Boston Terriers are very athletic dogs. They love to run, jump, chase, play ball, and even go for a dip on a summer day. With their characteristic laidback attitude, Frenchies are not nearly as athletic as Bostons. As a result, they don’t require a high activity level. In fact, French Bulldogs are unable to swim due to their anatomy. Their short stature and legs don’t allow them to. One thing you have to keep in mind if you’re interested in buying or adopting a French Bulldog is that Frenchies still need to exercise. This is in order to prevent them from gaining a lot of weight due to overeating. Obesity is a common problem of this breed. Still, a short stroll twice a day or access to a small yard will suffice. That’s why this breed is an excellent option for apartment dwellers. On the other hand, obesity is extremely rare in the more rambunctious Boston Terrier. The breed requires moderate amounts of exercise to outlet the buildup of excess energy in their agile bodies. Overall, active families with children provide a better environment for Boston Terriers. French Bulldogs are more suitable for adults with a laidback lifestyle. We hope today’s brief guide has informed you of the main differences between a Boston Terrier and a French Bulldog. Even though they might look alike, they’re actually quite different breeds. More importantly, they’re suitable for different kinds of people. If you have to make a decision between the two, keep in mind the information we presented you with above. That way, you can make sure you’ll provide your dog with a loving and safe environment. What’s the Difference Between an American Bulldog vs Pitbull? What Are the Most Protective Dog Breeds? Is My Child Ready for a Puppy? What Are The Most Dangerous Dog Breeds? Malt Liquor Vs. Beer: What Are the Main Differences? What’s the Difference Between Fruits and Vegetables? What’s the Difference Between a Credit Score and Credit Report?